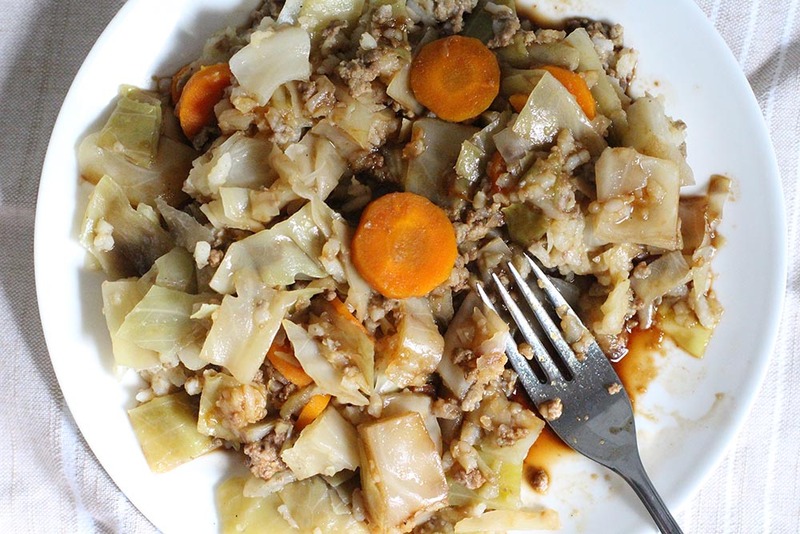 This crockpot cabbage casserole is a delicious and healthy dish that is going to turn your whole family into cabbage lovers! The combination of meat, brown rice, and slightly crunchy veggies can’t be beat and addition of soy sauce is icing on the cake. Throw in the fact that the recipe is super simple and you’re going to want to make it over and over again. If there is one thing that is predictable about children, it is that they are unpredictable! Our now four year old used to be the best eater, now he’s super picky! This crockpot cabbage casserole recipe is a winner with my whole family. 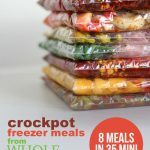 It’s one of my all-time favorite meals from my childhood, and I’m so happy to translate it into an easy crock pot recipe that my children enjoy it as much as I do! 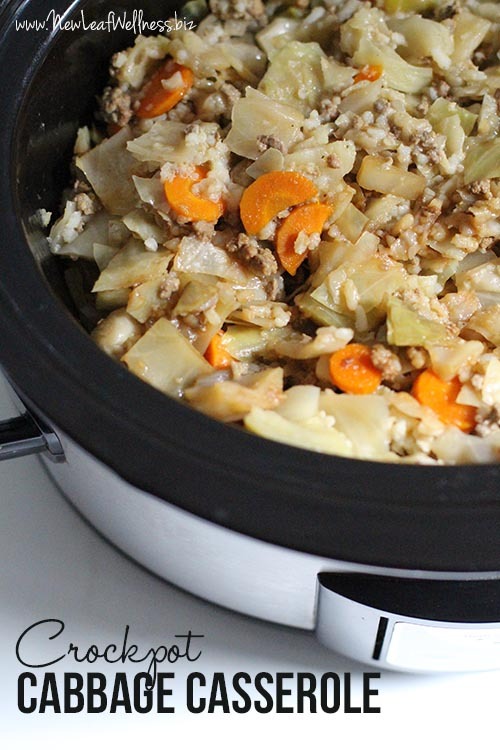 Remove pot from heat and add cabbage, carrots, salt, and pepper. Stir to combine. Place rice in the bottom of the crockpot. Pour meat/cabbage mixture on top of rice. Cover, and cook on “low” for 4-6 hours. Label your freezer bag. Add all ingredients EXCEPT for brown rice and chicken broth to bag. Remove as much air as possible, seal and lay flat in your freezer for up to three months. When ready to cook, thaw, spray crockpot with cooking spray, place rice in the bottom of the slow cooker, add ingredients from freezer bag, and pour broth on top. Cook on “low” setting for 4-6 hours. Stir before serving. Serve with soy sauce. 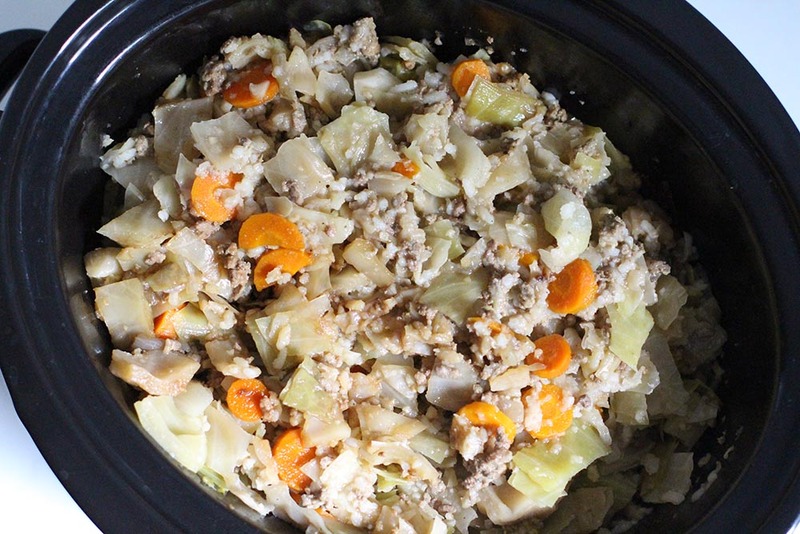 This crockpot cabbage casserole recipe fills a 6-quart crockpot to the brim and yields A LOT of food, so if you have a smaller slow cooker or are cooking for less people I recommend completing Steps 1&2 and freezing half of the cabbage/meat mixture for later. Cut the amount of rice and broth in half. Keep the cooking time the same. Would it be ok to add other veggies too? If so, what would you suggest? I think it would be OK, but I love it as-is. 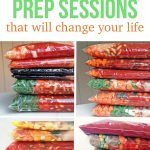 It’s also A TON of food, so if you add more veggies you might need to decrease something else to fit it in your crockpot. When you freeze, do you have to brown the meat first or just put it in the ziplock? Also, do you thaw and brown first before putting in the crockpot or just just put all ingredients in raw and start the crock pot? Thank you! Raw and raw. So easy! Could you just add the ground beef to the crockpot without browning it first? I’ve seen other recipes on this website that call for that, and I LOVE the convenience factor in it!! Just wondering if this recipe could be done that way as well? Yes, I think it would work. If you freeze it ahead of time, I would put the beef at the top of the freezer bag so it’s the first ingredient dumped into the crockpot. I’m new to the “prepare your dinners ahead” movement, but I live the idea! For this recipe, should I cook the cabbage before freezing it or can I freeze it chopped and raw? Thanks in advance! Looks great, do you think I could substitute white rice for the brown?